To clense the blood at Springe and fall take in ye morning a Spoonfull and a half or two Spoonfulls by it self or in beare or white wine in ye morning fasting. fast one houre after it and use moderat exercise do ye same at 4 in ye after noone and continew this till one pint be drank oft. To cure ye french desease geve it mornings & at 4 of ye Clock. 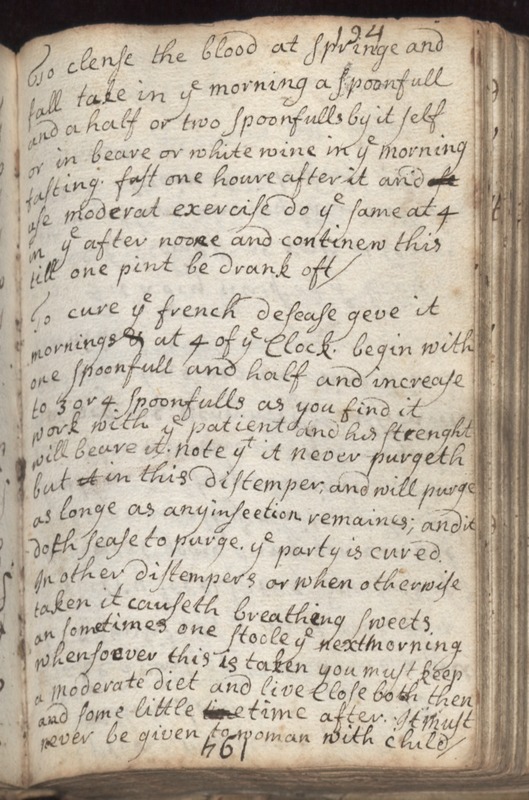 begin with one Spoonfull and half and increase to 3 or 4 Spoonfulls as you find it work with ye patient and his strenght but in this distemper, and will purge as longe as any infeection remaines; and it doth sease to purge, ye party is cured. In other distempers or when otherwise taken it causeth breathing sweets. an sometimes one stoole ye nextmorning whensoever this is taken you must keep a moderate diet and live Close both then and some little time after. It must never be given to women with child.